With many thanks for your generous support, wishing you happy holidays and a good season ahead. In only a few months time, the number of participants ages 5-12 participating in the daily “Warm Room” after school program grew from eight to over 30. Led by Jindas and Lod “Chicago” Multicultural Center project coordinator, Maha Shinawi, staff literally hit the streets, collecting and accompanying some of the neighborhood’s most vulnerable children into the “Warm Room” program space. Especially serving those families unable to provide supervision or a hot meal for their kids in the evening, the program provides more than just a safe and reliable care option. Each afternoon includes a period set aside for homework support, experiential learning, an arts/culture/recreation activity, and time to eat and relax. The program envisions a group of young people with a sense of confidence that they belong, the capacity to set and achieve goals, and tools for self-expression. The hardships facing so many of the kids who enter the “Warm Room” everyday reflect the unique challenges of our neighborhood. Some participants depend on the initiative for an adequate meal, while others come from households limited by underemployment, parents working odd hours for low pay, and without any way to provide afternoon supervision for their kids. Eight regular “Warm Room” attendees have lost a parent, and the majority come from single-parent homes. Maha Shinawi brings many years of experience working in community organizing and childhood education to her role as "Warm Room" project manager. She sees the many facets of her work as working in tandem. Besides organizing the program itself, functioning as the lead point of contact for participants, Maha believes in relationships with kids parents or caretakers. In a context with such severe barriers to entry and acces, the “Warm Room” room recruitment process starts with questions, says Maha. “I know that negative behaviors stem from kids’ need for attention that they just don’t get enough for any number of reasons. What do they want to do with their time, what do they want to tell us, what is it that they have to share?” Maha developed this incredible project from scratch, securing small donations of food from local businesses in order to provide snacks, recruiting a core group of teenage volunteers from the neighborhood, and drafting a vision to gradually expand and enhance the "Warm Room" in the months ahead. 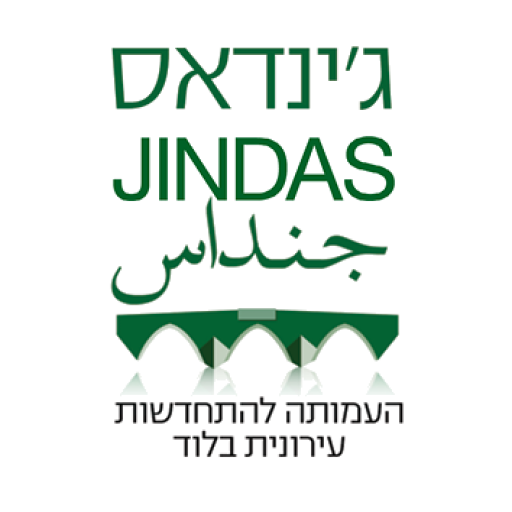 Beyond community development, Jindas is excited to launch a process of restoration and renovation of “Beit HaKeshtot,” remnants of the Ottoman period olive press just a block away from Jindas offices and the Lod "Chicago" Multicutural Center. The planning process, to span the next six months, envisions an arts and culture space benefiting the local community and visitors. Along with public participation activities as part of master planning for the Old City area, the initiative is carried out in partnership between Jindas, the Municipality of Lod, and Lod Multicultural Center. Also, in addition to a thriving “Warm Room” program, Jindas community organizers, Aulfat, Tali, and Ungudai, continue to coordinate successful activities serving a range of constituents in partnership with the Lod “Chicago” Multicultural Center. Recent gatherings included a cultural performance of traditional Arab song and dance around the new year, ongoing coffee “dates” bringing together older Jewish women in the community, an embroidery stitching workshop attracting beginners from throughout the area, and the opening of a small Arabic language library at the Lod Multicultural Center.